A Greyhound bus cruised by me on I-95 here in Connecticut. And what terrific memories that stirred up. I used to ride Greyhounds a lot. And liked it. Most of the time. I began a Greyhound rider after I retired. I rode Greyhound all across the country and back, and up and down and crosswise, too. Many trips. Long ones. Short ones. Thousands and thousands of miles. A marvelous experience, by and large. Who hasn’t seen a Greyhound! They’re an every day part of our American life. Millions of us ride them. Yet it’s surprising how many millions more don’t and never will. Are you one of those? Maybe my experience will change you. I hope so. But first, something I must tell you, dear readers, A good chunk of what follows comes word for word from an article of mine that the Christian Science Monitor published way back in 2001. I have beefed it up with some extra thoughts. I have three children, adults all, and they live in Florida, California, and Washington State (Mark now lives in Wisconsin). I like to go see them, but my frequent mode of travel worries them. It also bothers my friends. They speculate about me, and frown. I live in the Northeast, but I don’t travel those great distances west and south by train or airplane. I take the Greyhound. Right now I’m on my way to see Mark in Seattle. By Greyhound. (Remember, this was back in 2001.) It’s 6 a.m., before dawn. We’re in Oregon, but I can’t make out the countryside. I love these early hours. The bus is dark, and everybody else is asleep. I feel meditative. I don’t get bored on the bus. Honestly, I don’t. I look out the window. There’s lots to see, even on prairies or deserts. I read. I write. I talk with my seatmate, if I have one, though I prefer an empty seat next to me. Or I talk with the driver, if I can. I like the drivers. They’re helpful, and excellent at what they do. We’ve had three women drivers on this trip. We have one right now. She’s short and tiny, but she handles this big baby easily. I’ve been driving 50 years, but I’ve learned many of driving’s finer points by observing Greyhound drivers. No spurts of speed, no sharp braking, no lane-hopping, no tail-gating. Anticipate! Always anticipate! In the past four years, I’ve crossed the country four times this way. Last year I made a complete circuit of the United States – some 13,000 miles in 75 days. A nice adventure. “Why don’t you fly?” people have asked. I do. In the past 12 months, I’ve flown across the Atlantic six times. And I’ve flown around the world, and in the U.S. innumerable times. The best things I can say is planes are fast, and safe. Period! I won’t mention the bad things. No need. You know them. “Why not ride trains?” I’ve ridden numerous trains. Once I rode a train for 37 hours straight across a big chunk of India. A few years ago, at the end of a long train trip, I rode the rails into Los Angeles. Know what? For an hour before pulling into the station in L.A., all I saw were the backyards of tenement houses, factories, warehouses, junkyards, and vast railroad yards. Not the prettiest real estate in the City of Angels. That’s typical of rail approaches in most big cities. I’ve never found a train that could take me high into the mountains, or down into a lovely valley, with many splendid views along the way. A Greyhound can. Trains take the flattest, straightest route possible, interesting or not. Usually not. But the Greyhound often would take me into small towns and big ones and cities, too, of course, and maybe right up their Main Street. I loved to size up everything through the big windshield and the big windows on both sides. Because the bus is so much higher than cars, I could even see over any SUVs. In Sacramento, for instance, our bus drove right up the beautiful main drag. The impressive California State Capitol was straight ahead. How exciting. I have a triple reason to travel by bus. I want to get to my destination comfortably, of course. And I like a bargain, which buses usually are. But I also want to enjoy the trip. Remember the old saying? “To travel hopefully is better than to arrive.” Robert Louis Stevenson said that. Like him, I want to see everything. Cities and towns, farms, ranch lands, forests, rivers, big manufacturing companies. I’ve taken the bus to many big cities: Baltimore and New Orleans; Phoenix and San Diego; Vancouver, British Columbia; Chicago; and many others. I’ve seen smaller cities like Tulsa, Okla., and Tallahassee, Fla. I’ve seen Annapolis, Md., El Paso, Texas, and Coeur d’Alene, Idaho. And plenty more. Seal Beach, Calif., and Roseburg, Ore., Butte, Mont., Las Cruces, N.M., and Lubbock, Texas. And Lake Charles, La., and Kalispell, Mont. I could go on with a long list. Practical geography, I call it. It helped me understand our country. I’ve seen the Ohio, Mississippi, and Colorado Rivers. Bts of the Great Lakes.I’ve crossed the Great Smokies, the Rockies, and the Sierras. I’ve ridden through the Great Plains and the Mojave Desert. I’ve seen the vast lettuce fields outside Yuma, Ariz., and the huge strawberry fields on the central coast of California. I’ve seen huge wind farms, with their countless great turbines – the power-generating technology of tomorrow. And huge reservoirs and dams. I believe I’ve seen something else. Something more important: I’ve seen what the United States is today, and what it is becoming – a smorgasbord of races, nationalities, religions, and lifestyles whose diversity is richer than ever, and assuredly becoming even more so. For sure we’re the most multi-everything nation the world has ever seen. It’s been good to see all this through my own eyes, rather than through television, newspapers, or the movies. I’ve been able to reflect upon it, to feel current about what’s happening. In a small way, I see this incredible mix right here on this bus. After all, who rides the bus? Minorities: African-Americans, Latinos, Native Americans. People without much money: college kids, young soldiers and sailors and Marines, single mothers with children, grandpas and grandmas. And who hasn’t seen a movie or read a book that tells of somebody just released from the penitentiary who was given a bus ticket to get home? Maybe there’s somebody like that on this bus. No idea. I’ve had countless pleasant encounters. One time I had an old Mexican field worker sitting to me. Still in his bib overalls. Our language problem was a big one. Come noon he opened a brown paper bag and offered me part of his lunch. I said no. He absolutely insisted I have a piece of his grinder. I took a piece. I’ve experienced that kind of goodness time and again. But for sure Greyhound customers are not representative of all the up and down social dimensions of our people. No argument about that. But it’s good to get a view of some of our less privileged folks we’d never get to see up close otherwise. Sometimes on these trips my white skin has put me among the minority on the bus. This was a shock at first. I became comfortable with it. And Greyhound’s service isn’t perfect. Some seats are better than others. For food breaks, often we stop at a greasy spoon. And it’s always a shock to pull into a terminal at 2 or 3 a.m. and we’re all drowsing and suddenly the driver snaps on all the lights and barks, “Hey, folks! Service time! Everybody off! We have to fuel up and clean up this baby.. You can get back on in 45 minutes.” Try that at 3 a.m.! Bus travel has an image problem – it’s not cool. I admit it. Some of the terminals are terrible. Their sandwich shops can be awful. No way to reserve a special seat on the bus. I had a suitcase stolen in the Greyhound depot in Washington, D.C. Another time I lost a suitcase–an attendant put it on the wrong bus–but Greyhound tracked it down and got it back to me. It took three weeks. Yet, all this said, I have great respect for Greyhound. It deserves that. Another thing, very important: I’m no longer fearful – automatically, instinctively fearful – of others just because they look different. Or because they’re strangers. Most of us live isolated lives, in neighborhoods among many just like us. For me, bus travel has been a grass-roots lesson in tolerance. Isn’t that a good thing? It may also interest you that I have also ridden Greyhounds in Canada and Mexico. Know what? In Canada, long-route Greyhounds often tow a box trailer. With the same Greyhound markings on its side. For freight, I was told. A sort of UPS, it seems. Never see that here. 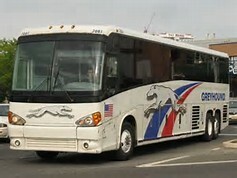 Truth be known, many of our regional bus companies in the U.S., with names of their own, are also Greyhound affiliates. You would never think that. So, Greyhound is much, much larger than you may think. I have also ridden buses in Europe. Many times. Many destinations. Many countries. Not Greyhounds. The big company over there – and it is very big, in fact, it is international, blanketing Europe, is Eurolines. Excellent. Before long I decided Eurolines did a better was better than Greyhound, as good as it is. The big exception is in Great Britain, where the big company is National Express. I wouldn’t be surprised if that’s also part of the Greyhound family. Or of Eurolines. Greyhound serves millions of riders. Yet it’s surprising how many folks would never think of taking a Greyhound. Unfortunate. But Know what? After a big airline accident, with front-page headlines about many dead and injured, lots and lots of people flock to Greyhound. But that’s just temporary. Back to the planes they soon return. For my first big trip by Greyhound, I boarded a bus in Manhattan and rode it all the way to San Francisco–3,000 miles. The price was $129, I believe. Quite a bargain. That was back in 1990, I think. That was for a three and a half day ride from the Atlantic to the Pacific. On and on we rode, hour after hour, with just a half hour or an hour stop now and then for toilets and meals. Greyhounds do have a toilet at the back, with stainless steel everything, and it’s clean. Usually. But the swerving and braking make it difficult. So it gets used only in desperation. But that toilet was an enormously important innovation. For both passengers and drivers. No longer did drivers have to put up with passengers pleading, please, please, for an emergency stop. That first long ride of mine reminded me of the fabled Pony Express 150 years ago or so. Each rider– they were all very young fellows– would gallop along on his horse with a bag of mail for eight hours or so. A new rider would be waiting for him with a fresh mount. He’d grab the bag and speed on for the next eight-hour leg. Finally, California! The big difference now is you don’t switch buses. It’s the same bus all the way. But as in those olden days, a fresh driver comes aboard for the next shift. Of course, the drivers are men and women now. All proud professionals. Those old jokes about woman drivers no longer apply. On that long trip, I soon found out not everybody was crossing the country like me. Most folks were just making short hops, from one city or town to another. We wound up just half a dozen of us going the whole way. But I used Greyhound for short hops, too. Here’s an example. I would be flying to California every late December for Christmas and New Year’s with my daughter and son-in-law in Morro Bay. I would land in Los Angeles, and then hop a Greyhound for the six-hour ride up to San Luis Obispo. Just 12 miles from Morro Bay. Monique and David would be waiting for me. Two weeks later they’d put be back on the Greyhound going south. To be honest I had some rough moments on Greyhound. I remember in Oregon when we were crossing a mountain one stormy winter night. Awful night. All traffic got stuck half way up. Nothing going up. Nothing coming down. The driver kept the bus running so that we had heat. We sat there in the bus and fidgeted for close to three hours. A lot of grumbling, of course. Some passengers kept bothering the driver, asking when? When? If anybody had a right to complain, it was that poor guy. Imagine if his family was expecting him home by a certain time. But he stayed pleasant. Hah! By now the line to the toilet at the back was long. In fact, I was in it. Finally we got started again. Traffic had backed up a couple of miles in both directions, we found out. Another time I missed a bus! We were up in the state of Washington. I was on my way to Seattle to see my son Mark. He was finishing his Ph.D. at the University of Washington. We made a 15-minute stop in a small town for a toilet and smoking break. I don’t smoke. I went to the john. A busy place. I had been sitting right behind the driver, with the seat next to me empty. I had made friends with two ladies sitting across the aisle. I left my stuff on the seat when I got off the bus. When I returned to get on the bus, it was pulling out! I couldn’t believe it. The drivers are supposed to take a passenger count at each stop. How come he hadn’t noticed I hadn’t come back? Also, how come the two ladies hadn’t noticed and alerted him? What to do? On the bus, my stuff was still on the seat where I had left it. The two old ladies saw me but had no comment to make. I managed to keep my mouth shut. One awful incident changed Greyhound drastically. I don’t remember the date. Just a routine trip. A male passenger got up, walked up and attacked the driver, who lost control. The bus ran off the highway. Don’t ask me how many dead and injured. I don’t remember. But within a couple of months, every Greyhound had a protective cage newly installed around the driver’s seat on its hundreds of buses. Furthermore, the two front seats on the right side, the best on the bus, were no longer available to passengers. Drivers started keeping their jackets and luggage on them. To keep us off them! That was bad news for me. I used to show up early to get one of those seats. I loved the clear view ahead. And I enjoyed chatting with the drivers, and it was a rare one who didn’t enjoy it, too. I got to learn so much about their way of life. By the way, as some of you old-time readers of mine know, I was also doing a lot of solo travel around the country in my wonderful little VW camper. That was a completely different kind of travel, of course, with wonders and problems of a different kind. Take my word for it. I enjoyed Greyhound. Well, most of the time. But riding through the night on a darkened Greyhound is no fun. It’s hell. Can’t wait for dawn to break. The only fun is telling about it later. As I’m doing with you right now.